Plant a tree in memory of Mary "Evelyn"
Be the first to share your favorite memory, photo or story of Mary "Evelyn". This memorial page is dedicated for family, friends and future generations to celebrate the life of their loved one. 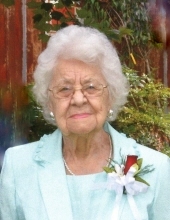 Mary “Evelyn” Duffie Robinson, age 97 of the Jake Community, passed away Sunday, January 20, 2019 in a local hospital. She was born in Carroll County, February 6, 1921, daughter of the late Perry E. Duffie and Marilla Burt Duffie. Mrs. Robinson graduated from Bowdon High School in 1942 and retired from Sewell Manufacturing Company after working there for many years. She loved taking care of her family. There was always plenty of food on her table for anyone who came by her home. She also loved gardening, sewing, quilting and camping. Mrs. Robinson was a member of Grace at Five Points Baptist Church. In addition to her parents, she was preceded in death by her husband, John Murphy Robinson; three sisters, Zann Duffie, Lillar Ward, Rachel Rooks and three brothers, Olen Duffie, Garfield Duffie and Cyril Duffie. Survivors include children, Shirley and Bobby Upchurch, Jim and Pat Robinson, Franky and Retha Robinson, Charlotte and Charles Hamm; grandchildren, Michelle and Lee Jorgensen, Alan and Robin Robinson, Jason and Marlo Robinson, Shane and DeeAnne Robinson, Missy and David Bradley, Chad Hamm, John and Corie Hamm, Benjamin Robinson; great grandchildren, Kelsey Jorgensen, Kyle and Taylor Green, Murphy Robinson, Elizabeth Bradley, Meredith Bradley, Zoe and Tucker Robinson, Walker Hamm, Michael Azilyn,, Jack Hamm; great, great grandchildren Gunner and Griffin Green and a brother, Milton Duffie. The family will receive friends at the funeral home Thursday from 4:00 until 8:00 PM. To plant a tree in memory of Mary "Evelyn" Duffie Robinson, please visit our Tribute Store. "Email Address" would like to share the life celebration of Mary "Evelyn" Duffie Robinson. Click on the "link" to go to share a favorite memory or leave a condolence message for the family.